WHERE IS DOMINICA ? One of the most frequently question ask on weblog or when traveling. There are many people who have never even heard of the island, much less to know where it’s located on the World Map. Dominica is an island in the Caribbean Sea; Dominicais located between the French islands of Guadeloupe andMartinique.Dominicashould not be confused with Dominican Republicwhich is one of the counties in Hispaniola to the north of theCaribbeanisland chain. Dominicais unspoiled natural beauty; it is the most mountainous island in theLesser Antillesbeing formed by geothermal-volcanic activity.Dominica is also known to be the home of the world’s second-largest boiling lake. TheislandofDominicais encompass with lush mountainous rainforests and is home to many rare plant, animal, and bird species. The climate is tropical; the wettest season is from June to October when hurricane often occurs. 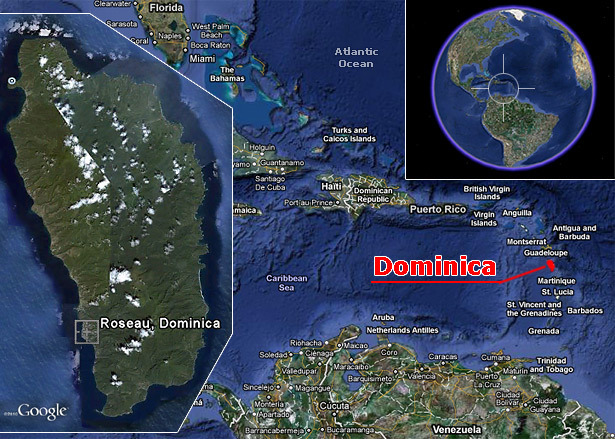 Find out more about “Where is Dominica” and Where Dominica is located by going thought this website pages.